Winter can be broken down into two main categories of weather. 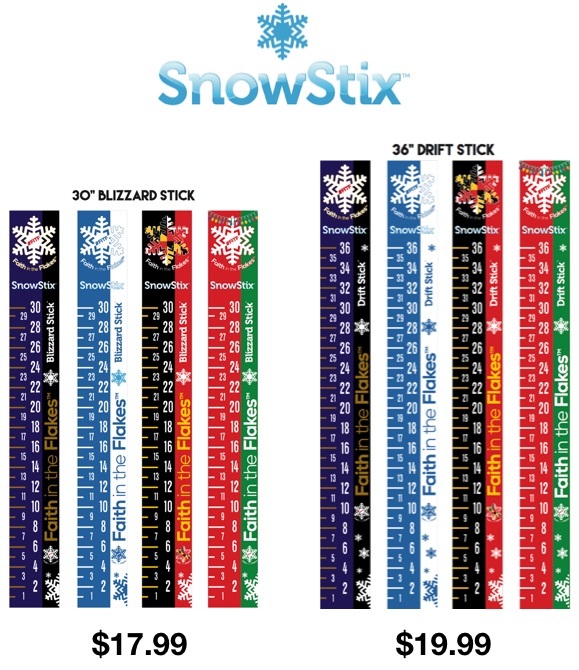 First is how much snow will fall. The other are the temperature. See more on that below. 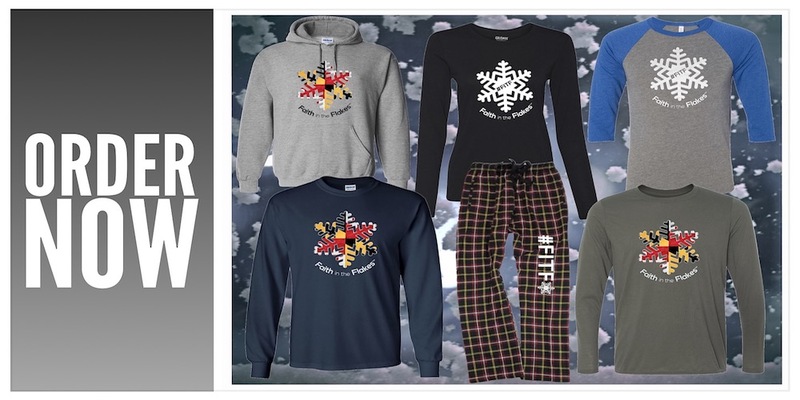 Snow in Maryland really highlights multiple climate zones across a small area. Elevation plays a big role as the mountains in western Maryland reach above 3,000 Ft and can catch Lake Effect (more like enhanced) snow. An average winter will bring 104 inches to Deep Creek Lake, the home of Wisp – the only ski resort in the state. Just east, the mountains get lower and can experience a rain shadow effect where the air dries out downslope from the mountains. Various ridges and valleys can make for a dramatic difference in snowfall all the way to Frederick which averages 20.5″ a year. Notice that is almost the same as Baltimore’s BWI which averages 21 inches of snow. Sublimation – Snow skipping the melting and ice crystals going to gas form. It is not evaporation but rather sublimation. Virga – Snow seen on radar but sublimating and appearing to dry up before reaching the ground. Overrunning – Warm air can rise over a cold air mass. So the clouds can be warmer than the ground. Hills can be warmer than valleys too. Inversion – when the air temperature warms with height. It can be warmer on a hill top and colder in a valley. Same with a colder ground vs. warmer clouds. Freezing Rain – When rain freezes on contact with a colder ground. This is due to overrunning. It can rain with surface temperatures in the teens, if the water droplets are warm enough to no have a chance to freeze on their trip down. Sleet – Rain freezing into ice pellets on the way down through a colder layer of air. NOT hail! Snow – The most wonderful thing in the world. Ice crystals from sub freezing clouds to the ground. It can possibly snow with air temperatures was warm as 47°F if the snowflakes themselves are cold enough to remain frozen to the ground. Graupel – Partially melted and refrozen snowflakes. The edges curl in and they look like tiny styrofoam balls. Lake Effect Snow – The cold air over the Great Lakes creating an unstable environment and heavy snow downwind. This usually stays close to the lakes and does not cross the mountains. Alberta Clipper – A fast moving storm originating in Alberta Canada that can drop a quick few inches of snow but often comes with very cold arctic air. This can also be a Saskatchewan Screamer. A truly dramatic showing of snow variation is around Baltimore. To the northwest, the elevation rises from near sea level to 1,000 feet in parts of arrow County and northern Baltimore County in the Hereford Zone. These paces average over 30 inches of snow, or at least 50% more than BWI. But on the east side, the low level and proximity to the Chesapeake Bay keep temps just warm enough to often change snow to rain and curt down on accumulation in many events. East coast storms bring in winds and moisture off of the warmer water. Until the northern Bay freezes, it can be a source of heat. But the rise in elevation is why the Northwest suburbs can average more snow than some of the higher mountain areas to the west. I-95 is a separation of snow vs. rain for many storms. The warmer conditions and more rain tend to fall east of I-95, where the elevation is around sea level and warming from the Chesapeake Bay is just enough to stay above freezing. When a storm arrives from the west, it will often dump snow or rain on the mountains, but dry up in the valleys and lower elevations farther east. That is why they can appear to break up or fall apart sometimes. With areas near sea level, warmer winds can play an easier influence within storms. That is why this area gets a lot less. But notice the lowest amount are places closest to the water. Interior Delmarva can escape this and get a little more in a typical winter. Atlantic Continental Shelf: Generally flat, influenced by the Atlantic Ocean and Chesapeake Bay water keeping it warmer than freezing in most events. Western Shore Uplands Region: Marked very close to I-95. Some rolling hills, but still influenced by Chesapeake Bay warmer water. Upland Section: Rolling hills, increase in elevation close to 1000 Ft above sea level. 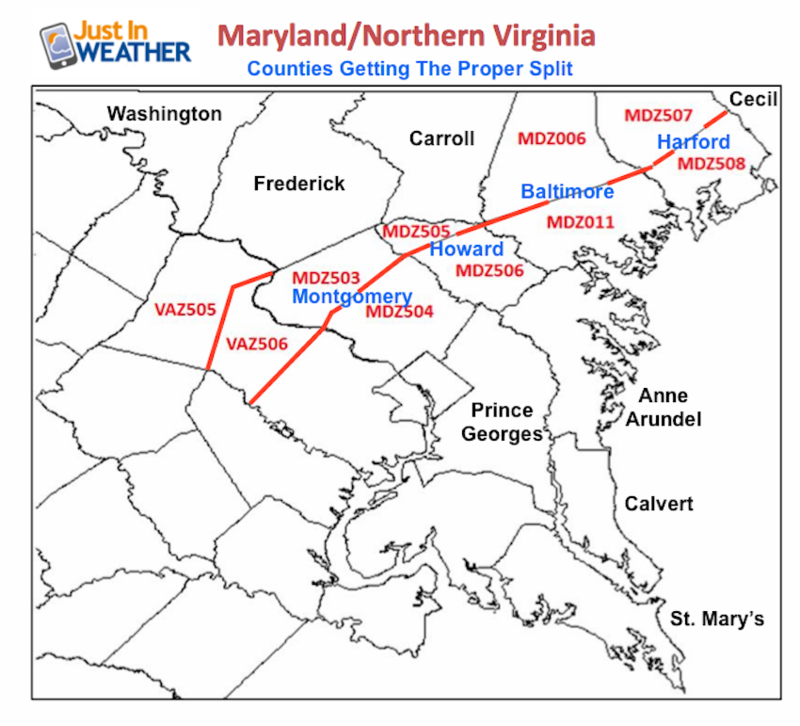 This includes the Hereford Zone in northern Baltimore County, but that ridge extends to northern Harford, much of Carroll, and western Howard Counties. The higher elevation and distance away from the water can often be cool enough to allow more more snow to fall and stick. Lowland Section: This is broad valley between Frederick and Mount Airy. Temperatures can be warmer at lower elevations and trap cold air near the surface in some winter storms while warmer air is pushed above mountains. This is a prime target for sleet and freezing rain = ice storms. Blue Ridge Province= Catoctin Ridge. Mountains reach up to around 1,500 Ft.
Mountain Region: Great Valley Section, Folded Appalachian, and Allegheny Mountain Section. This region has steep mountains and valleys. The elevation reaches above 3,000 Ft in far western Maryland- Garrett County. This can catch Lake Effect Snow from Lake Erie in addition to larger coastal storms. 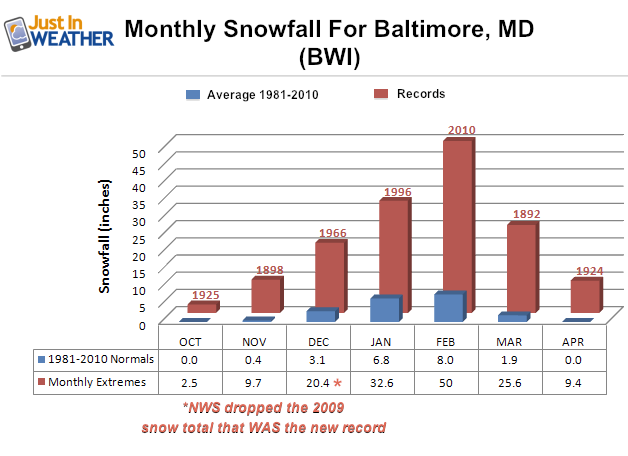 Average snow per month at BWI increases each month of winter until February. About half of our top 25 snowstorms are in February. We had a pattern of a large snowstorm (around a foot or more) every 3 to 4 years. That pattern could have been considered broken with three blizzards in the 2009 to 2010 winter. But then again the Jan 2016 storm also broke the pattern. It should be noted that fog can be extra thick in the winter. This may be due to warmer, moist air moving over cold or frozen ground. Especially if snow is melting or sublimating. Using Baltimore’s BWI as a reference, seasons often experience a temperature between daylight, sun angle and temperature. The shortest daylight and lowest sun angle is on the winter solstice, around December 21. But while the days get longer and the sun angle grows higher after that date, it is still too low to make much of a difference until mid January. That allows area water ways a chance to freeze. It also allow time for snowpack to build up from storms an allow cold air masses to maintain their integrity, impacting us more. Wind Chill is how your body feels in the cold air. Moisture evaporating off of your skin makes you feel cooler, just like when stepping out of a shower.